Relax as you watch the setting sun sink over the African savannah and the Lion’s Pride mobile slot gives you 100 lines with a low minimum bet. Lion’s Pride HD slot looks beautiful. The details might appear simple at first, but look closer at the painted details and you’ll see this is truly one well crafted slot. The royal lion looks as comfortable on these reels as does the proud lioness or the curious cub. The Zebra and Gazelle complete this safari, along with your standard high card symbols. Think ‘authentic’ graphics rather than ‘cute and cuddly’. And with a setting sun in the horizon, we can see ourselves sitting by a low light one night, taking a few spins at this 100 payline slot. Because this Microgaming Lion’s Pride slot has plenty to recommend it. For a 100 liner, it has a relatively low betting range of £/€/$1, making this a great video slot for entry level players wanting to experience the thrill of a casino slot with so many possible paying lines. Stacked Wilds, free spins and a gamble feature ensures this mobile slot catches our attention. And it really does. It’s a great mobile slot machine. But for every positive there is a little negative that we cannot help but pull at, unravelling what should have been an almost perfect slot. The details of the graphics might be beautiful, but the uni-tone beige colour dominating this slot make it almost hard to really get excited for big wins as nothing quite catches your eye – especially on the much smaller mobile screen. The betting minimum might be low, but so is the betting maximum at only £/€/$10 a spin. We are all for ensuring that multi-line slots can appeal with those on a tighter budget, but slots with 50 lines+ were made for players who want to bet big per spin – certainly more than £/€/$10. It’s a little like the Game of Throne mobile slot. But at least there you have a choice and can play the 15 payline rather than 243 ways to win, which has a better betting range. The free spin feature, when it comes, is roaring with excitement – especially as the random multiplier makes you watch that screen like a hawk, hoping to catch the elusive 10x multiplier on a big win. But the key here is the ‘when it comes’. This feature takes patience to get and what excitement it brings, when it finishes, makes the rest of the game look lacklustre in comparison. 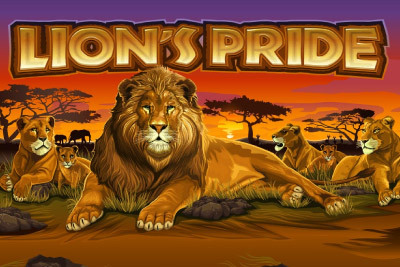 That said, the gamble feature is always good to spice things up on your main game wins and thank-fully this Lion’s Pride slot game has the quickspin feature, allowing you to spin those reels quickly for more interesting game play. The Stacked Wild will be the feature which might seem to be the least interesting of the lot, yet will bring you the most wins and get you interested back in the game. All in all, a mixed review but we will give it three stars for also working flawlessly on all the devices we tested. Stacked Wilds: The Lion's Pride game logo is the wild symbol standing for all other symbols except the scatter symbol. These often appear stacked across the reel and is the most common feature. Free Spins: 3, 4 or 5 African Mask scatter symbols trigger 25 free spins game. Exciting to watch and hear, these free spins come with a random multiplier generator giving you 2x, 3x, 5x, or 10x your win. A decent number of spins with some great multipliers. Gamble: Red or black? Ace, Hearts, Spades or Clubs? Pick the suit or colour of the hidden card to double or quadruple any of your wins at any point in the game. Lion's Pride mobile slot is a beautiful 100 pay line, 5 reels video slot that could have been great, but instead ends with being just a good mobile slot that we will return to from time to time, but doesn't quite make it to the favourite slots list. It looks far better on tablets than mobile and when the Free Spins feature hit, this slot really comes alive with big wins on a decent 25 free spins. Better yet, we recommend this slot for those who are looking to play slots with bigger number of lines, but do not want to caught out with paying big bets straight off.